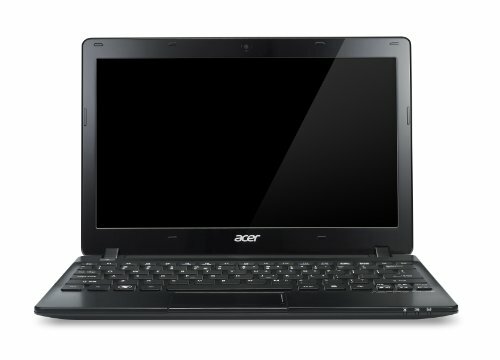 Below is our review of the Acer Aspire One 725, a 11.6" laptop, featuring 4GB RAM, 320GB hard drive and Windows 8. Powered by the dual core AMD C70 1GHz Processor, and the AMD A68M FCH chipset, the 725 sports a competitive 4GB RAM - which kept applications running smoothly, and without issue. Obviously, give the price tag of the 725, it doesn't run at quite the same sped as higher end ultrabooks manage - however for the sub £300 price tag, it is perfectly reasonable. The 11.6" HD display is billed as "Acer CineCrystal LED LCD", and despite the size it offered clear viewing, with a decent picture and colours being reproduced well. The overall size of this display may mean it is a touch too small to work in front of for extended periods of time - however for computing whilst out and about it was functional. Storage is catered for with a 320GB hard drive - which operated at a spin rate of 5400rpm - we had no issues with this aspect of the netbook during the test. In terms of external connections, the addition of an HDMI port is very handy - enabling you to output the picture to a TV or larger monitor. Also catered for are 3 x UBS 2.0 ports, headphones and microphone combination 3.5mm jack, VGA, Ethernet as well as a 5 in 1 card reader. Battery life was a fair bit better than a standard 15.6" laptop - smaller screen equals less power required - so handy for those who spend considerable time away from a mains socket. Finally the input methods - the keyboard and touch pad, were both functional, and offered comfortable control over the laptop. So what did we make overall of this netbook from Acer? Very light, highly portable, looks good. If you wish to run graphically intensive applications, you may wish to spend a little extra on a faster ultrabook. For what it is, a highly portable yet cheap solution to mobile computing, the 725 offers very good value, and is worth considering.